It is Memorial Day. For lunch we grilled hot dogs.. well actually we did it stove top, because our back yard is being taken over by thousands of angry bees, who have decided our house would make a rather nice home for them.. well, not if I can help it — we will be soon let them know that we don’t really want them squatting without paying rent. A friend suggested, I light the house on fire as smoke and lots of it calms bees down — good advice. He also told me to tell the firefighters to “buzz off” when they get here. Ah yes, with friends like this… anyway… there is always a cause for excitement at our home. We had lunch and I made salad. Combine the veggies and the dressing. Toss. Chill and serve. Categories: Side - Vegetable, Side Dishes | Permalink. Tri-Tip was on sale last week and I bought it, because it was cheaper than ground beef. I never made tri-tip before. Our barbecue needs some work done on it, so I wanted an oven version of it. Having read up a little on tri-tip, I found it needed some time to marinate with seasonings before cooking it to impart flavor. One recipe suggested cutting slits in the roast and putting whole cloves of garlic – I liked that idea! Nothing wrong with keeping Dracula at bay! Place the tri tip in a large glass Pyrex dish. Cut slits in the Tri-tip and insert the garlic clove halves in various places. Combine the spices in a small bowl and mix them. Coat the trip tip on both sides with the spice mix. Drizzle some olive oil over both sides of the roast. Cover the tri-tip roast with plastic wrap and refrigerate for at least 2 hours. Remove the beef about 2 1/2 hours before you want to eat. Allow the roast to sand for 2 hours to come to room temperature. Preheat the oven to 450F. Place the roast (fat side up) on the rack of a shallow roasting pan. Roast for 20 minutes and begin checking the internal temperature. (115-120F for rare; 120-125F for medium rare; my family likes it medium: 130F) My roast took 30 minutes of roasting time for medium. I let it rest for 15 minutes. I served it with a quick pan sauce (1 cup beef broth, 1/2 cup red wine, 1 Tbsp Dijon mustard and a slurry of cornstarch) and boiled potatoes with herbs. Slice the Tri-tip thinly at a bias. Our whole family enjoyed this. Why did I wait so long to make tri-tip? 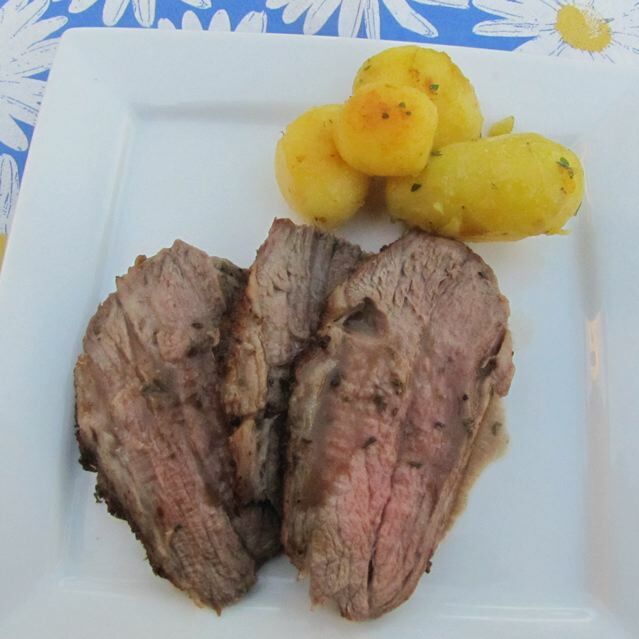 Categories: Main Dish, Main Dish - Beef | Tags: Easy Tri-Tip, Oven Roasted Tri-Tip, Tri-Tip | Permalink. 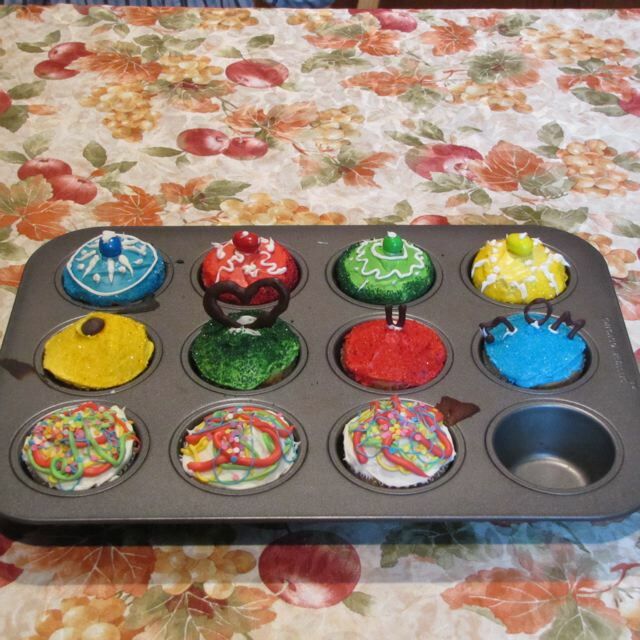 You guessed it: allrecipes again! It has been so hard to return to blogging (and cooking) after taking a great vacation! That does not mean I have not cooked at all since returning, it means I have not cooked with the intent to blog it. Here is another good recipe. 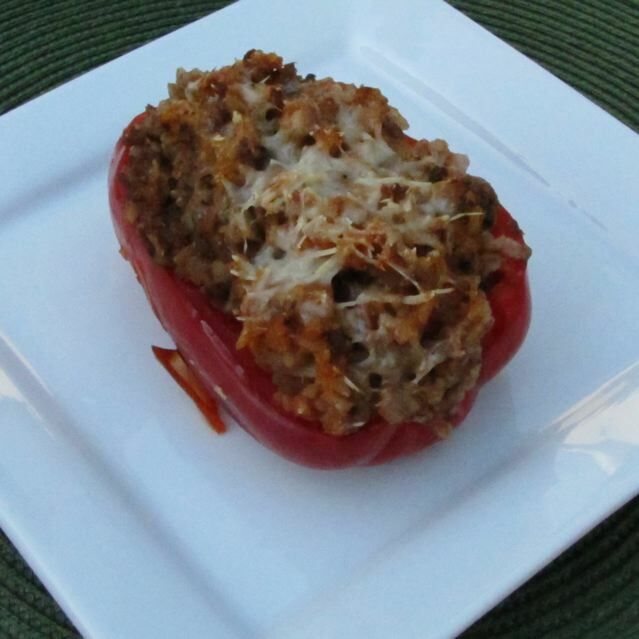 I have another stuffed pepper recipe we like a little better, but this was not bad! This recipe only served 2. I doubled the stuffing and used 4 bell peppers. I still had some filling left over. I did make a few other changes. And I would omit the cayenne pepper for the children. They thought it was spicy. My husband and I enjoyed it however. Cook brown rice according to package directions. You could use any brown rice, I like the texture that the brown Basmati rice gives the dish. Slice the bell peppers from top to bottom and remove stem and seeds and ribs (the white part of the pepper). Lay them cut side down on a microwave safe plate and microwave for 3 minutes to soften. Place the peppers in a large casserole (like little boats). Prepare the filling: In a large skillet, cook the ground beef and onions until the meat is no longer pink and the onions are tender. Drain any fat. Add remaining ingredients and stir to combine. Heat through. Ladle the filling into the prepared peppers. Sprinkle the tops of the filled peppers with the Parmesan or Romano cheese. Cover the casserole with foil and cook for 30 minutes at 350F. Remove the foil and cook another 10 minutes to melt the cheese. Serve with a salad. Categories: Main Dish, Main Dish - Beef | Tags: Herb Stuffed Bell Peppers | Permalink. This salad is once again from allrecipes.com. It is called “That good salad” (link) but in essence, it is a BLT salad that is quite good. I had just gotten a box or organic vegetables from a vegetable co-op and had most of the ingredients on hand. There is nothing quite like fresh – really fresh veggies! I followed the recipe almost exactly. I may change up the dressing a little the next time, as it was not seasoned very well, but once I put it over the salad, it did not detract from the flavors of the salad; it did not overpower the salad. I will be making this salad again and again. 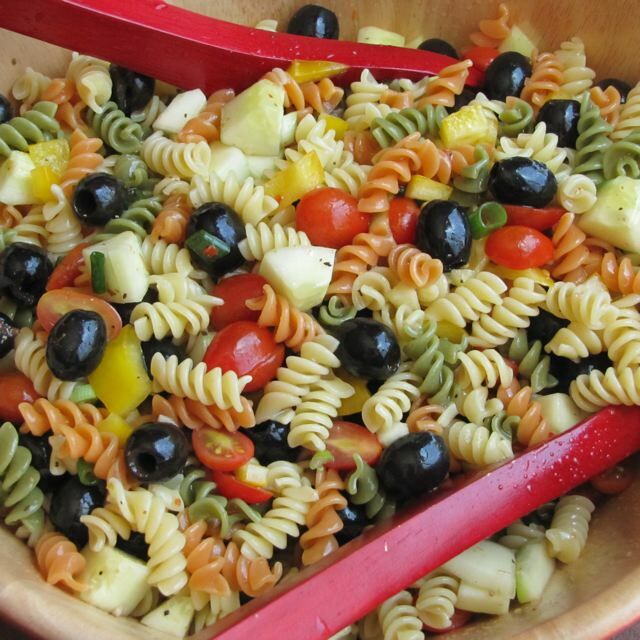 I halved the recipe from the original – if you are taking a salad to a potluck, do make the full recipe. Combine the dressing ingredients in a small shaker style salad dressing container. Shake to combine. Chill. 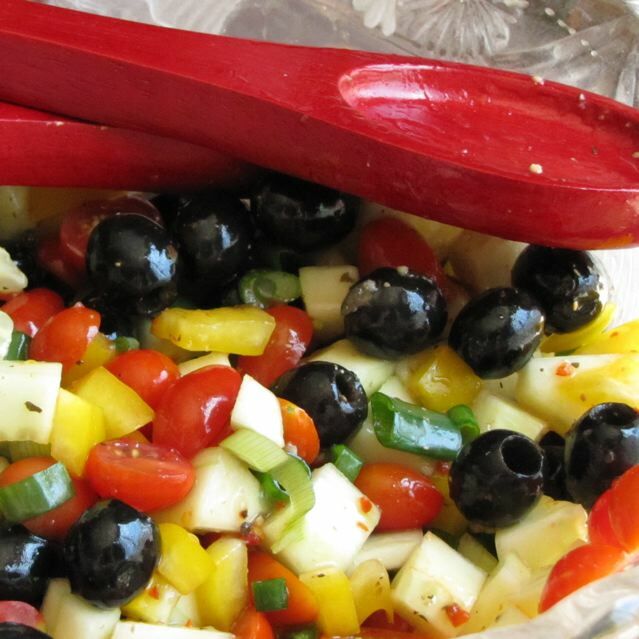 Toss the salad ingredients in a large salad bowl. (Reserve croutons for last moment). Shake the dressing and pour over the salad, toss. Add croutons on top and serve immediately. 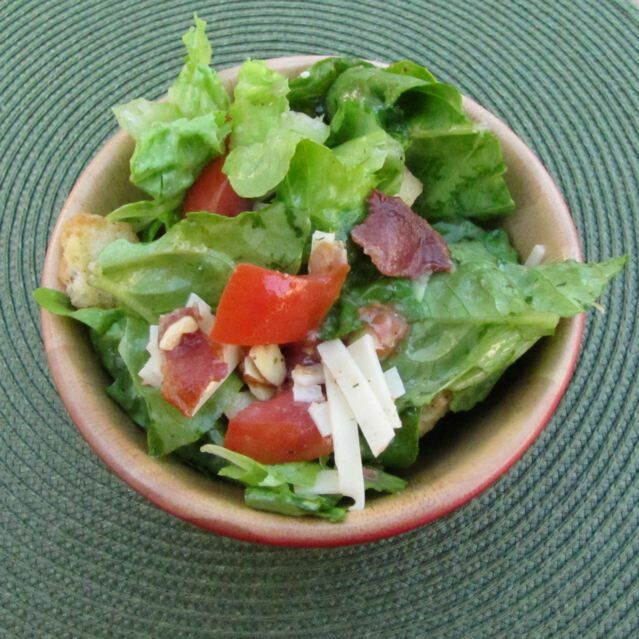 Categories: Side Dish - Salad, Side Dishes | Tags: BLT Salad | Permalink.